If you are one of the many international students reading this page, chances are you love video games. Nearly everyone loves video games, and a career dealing with video game development in the US is a dream for many international students. The decision amongst international students to study video game development in the US is on the rise, and for good reasons. Not only does pursuing video game development in the US lead to fun, fulfillment and lucrative career opportunities, the time for international students to apply to programs in the US has never been better given declines in domestic enrollment rates and a thriving video game industry with large production budgets. For those international students considering making the decision to study game development in the US, this page and its links will serve as a guide to better inform and orient you to the whole process and any common questions that arise along the way. What is video game development? So, what is video game development? Video game development is a computer and mathematics-heavy field that spans the entirety of the many aspects involved in creating a video game. This includes everything from conception and storyline to graphic design and programming. As such, international students who study video game development in the US will become familiar both with the whole production process of creating a video game, as well as each of its specialized aspects. Many video game development programs focus on providing a robust programming foundation to complement the education in the production aspects of game development. This focus on the actual software development of the game equips international students who study video game development to work on professional development teams, coding and rendering the next must-have title for gamers. 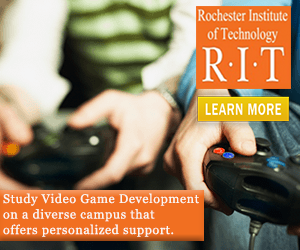 What courses can a student of video game development take? Often, the titles of these courses will vary between institutions, but the content and form of the degree is fairly uniform. What jobs are available in the field of video game development? What are some reputable places to study video game development in the US? Visit the Study in the USA School search to find schools that offer programs of study in Video Game Development. Over time we will be updating this section and including more information for those who want to study video game development in the USA and for other countries, but please feel free to post your thoughts and comments on our Facebook fan page, and also follow us and post questions through Twitter.